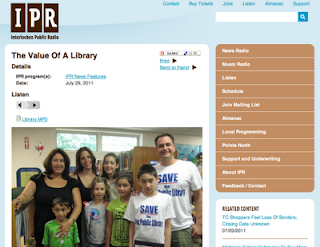 The Books for Walls Project: Save Troy Library Week: Kid Power on Public Radio! Save Troy Library Week: Kid Power on Public Radio! Just a few days until the August 2 election that will decide the fate of Troy Public Library. If you wonder at all if libraries are worth it, listen to this story, listen the kids! And spread the word, VOTE YES August 2nd. Send this post to everyone you know and help save libraries! For more information read our posts on Troy Public Library. Read our interview with the Fabulous Yashinsky Five! Happy Weekend and Happy Reading! Take a moment, have some reading fun, take a challenge!